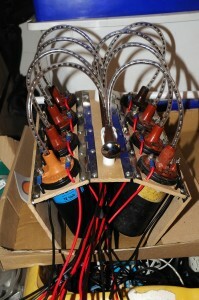 A 30 Kv power supply using 8 car ignition coils. The output of the coils are rectified with strings of 40 x 1n4007 diodes. Each ignition coil, run flat out, draws around 5A at 12V so in theory the output should be around 300-350W drawing around 40A from the 12V supply. The advantage of this drive is that there is no mains to back any fault, so it does make using the supply (slightly) safer than a mains powered unit. 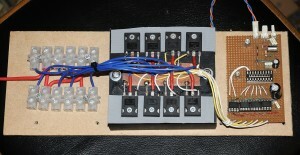 The heart of the power supply is the ECU. The ECU gives some control of the output power of the system. The power is controlled by a variable resistor which controls the average power to the coils. 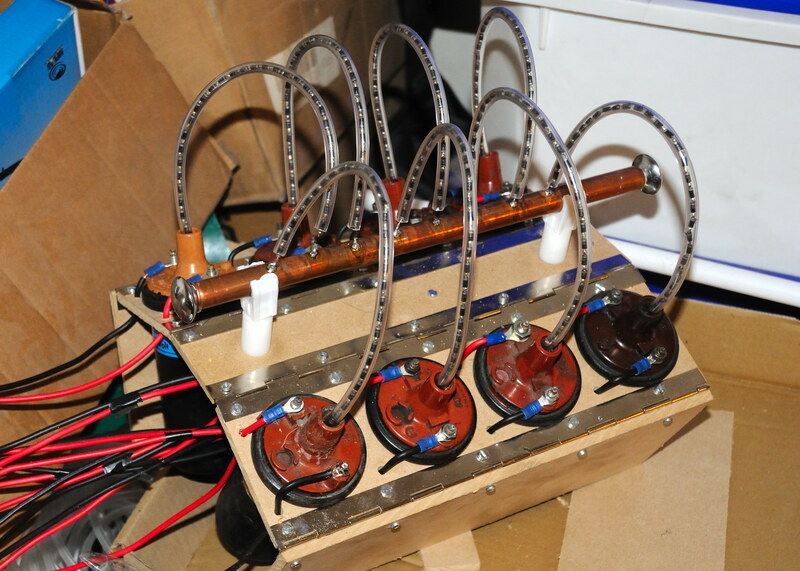 By arranging that no coils fire at exactly the same time as any of the others, the peak current draw from the batteries is limited, this allows smaller batteries to be used at lower powers. It also smooths the output so a smaller HV smoothing capacitor may be used. It effectively gives an 8 phase rectified HV supply.